Al Walkoe had a legal practice that specialized in probate and real estate, and a deep sense of justice that led to him spending five decades in San Diego ensuring that people who needed legal assistance were able to obtain it, even if they could not afford it. 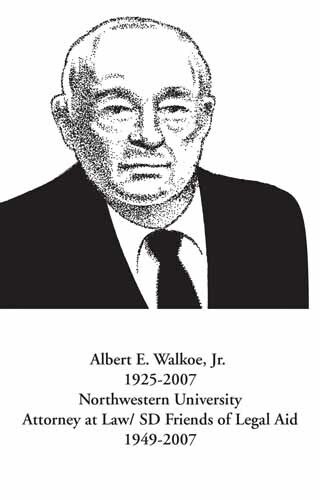 Raised in Chicago, Mr. Walkoe began college at Kalamazoo College before World War II interrupted his education. In 1942 he was commissioned as an ensign in the Navy and served on a destroyer. After the war ended, he returned to Kalamazoo College and later earned his law degree at Northwestern University. Mr. Walkoe committed himself to a lifetime of community service. The boards he served on included Legal Aid Society of San Diego, the San Diego County Bar Association and the Boys and Girls Club of San Diego. He was also a member of the San Diego Downtown’s Lion’s Club. His contributions to the community were many as recognized by ElderHelp of San Diego with the Essence of Life Award. When he retired in 1991, he created the nonprofit San Diego Friends of Legal Aid, and dedicated himself supporting projects at Legal Aid Society of San Diego, including Mediation and Restitution Services program, an alternative to the Juvenile Justice System for first time offenders, and Adopt-a-building program, which provided legal support to tenants in publicly subsidized housing at risk of converting to market rate. When Congress reduced funding for legal services in 1996 and imposed restrictions on the kind of clients and cases they could accept, Mr. Walkoe responded by leading Friends of Legal Aid into its next life stage as the provider of legal services in impact litigation. Friends accepted the transfer of all impact and immigration cases from Legal Aid, so those clients would not be without representation. A fitting legacy to Mr. Walkoe’s work, Friends continues to provide free legal services today doing business as Affordable Housing Advocates. Mr. Walkoe is survived by his wife, Shirley; a daughter, Joy; sons Paul and Matthew; two grandchildren; and two great grandchildren.